MONTEGO BAY, JAMAICA — In the wake of the sweeping GOP take-over of Congress last week, Dr. Pedro Noguera says he believes that efforts to improve urban education in the United States and other parts of the world will likely be stalled. Noguera—one of the nation’s most prominent scholars—offered his political prognosis to a group of about 500 educators who gathered here this week for the International Conference or Urban Education, convened by The Urban Education Collaborative at the University of North Carolina at Charlotte. Charlotte High School students gather with keynote speakers Drs. Pedro Noguera and Gloria Ladson-Billings at the International Conference on Urban Education. Dr. Chance W. Lewis, right, is the conference organizer. Despite anticipated cutbacks, Noguera urged conference participants to wage an aggressive fight against efforts by policy leaders who seek to initiate “experimentation in the name of reform” when it comes to educating poor and minority children. Noguera says that mounting efforts to eliminate teacher tenure in the United States is a deliberate attempt by some to distract from the more pressing issues that beset public education such as overcrowding schools. “Those who know the least about education have the most to say, and those who know the most, often have no say,” says Noguera. The theme of this year’s conference, Building and Sustaining Global Partnerships for Learning and Development has drawn participants here from as far away as England. The two-day gathering, which includes university professors, community leaders, health care professionals and other key stakeholders interested in urban education, includes a series of panel discussions and presentations focused on tackling challenges that impede student learning. “This is a true testament of stepping out and trying to make a difference,” says Dr. Chance W. Lewis, who holds the Carol Grotnes Belk Distinguished Professor and Endowed Chair of Urban Education at UNC- Charlotte and is the conference organizer. 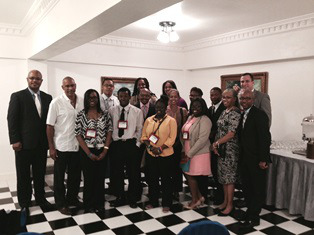 Lewis’ Urban Education Collaborative provided scholarships for a group of high school students from Charlotte to travel to Jamaica to participate in the conference and perform a service-learning project with other Jamaican high school students. Conference participants say that the opportunity to network and strategize with others from across the globe has been deeply encouraging.